At this point, it would probably be simpler to list what has stayed the same, rather than what has changed. The Kootenay Ice have a new ownership group, a new general manager, a new head coach, and another dozen new staff members. Other than the name and location, this could almost be considered an expansion franchise. Having been owned by the legendary Chynoweth family since their inception in 1996, the team had their first major shakeup in late March. After speculation ramped up that the team was destined for relocation, the Ice were sold to Winnipeg investors Matt Cockell and Greg Fettes. Cockell replaced Jeff Chynoweth as President and General Manager of the organization and relocated his family to Cranbrook. He subsequently made sweeping changes to the organizational structure and hired an entire fleet of new front office and hockey operations staff members. Luke Pierce was replaced by new head coach James Patrick, a former NHL defenceman who has spent the past 11 years as an assistant coach with the Buffalo Sabres and Dallas Stars behind Lindy Ruff. Assistant coaches Gordon Burnett and Roman Polak were retained, but are joined by new associate coach Jon Klemm, another former NHL defenceman who was born and raised in Cranbrook. Cockell also brought in a new goaltending consultant in Denis Sproxton, a new video coach in Ice alumnus Nathan Lieuwen, a manager of hockey operations and player experience in Jake Heisinger, a sports performance consultant in Adam Douglas, a strength and conditioning coach in Neil Ross, a mental skills coach in Doug Swanson and a health and wellness coach in Laurie Dickson. The Ice have a much bigger staff than in past years with NHL and junior hockey experience in abundance. Cockell, Patrick and several others, however, are rookies in their particular positions, so while enthusiasm should be high, there might be some growing pains. 1. Can management’s promise of ‘a new Ice age’ yield significant results in the standings? 2. Will first-time WHL head coach James Patrick manage to be effective at the junior level? 3. Will 2016 top draft pick Peyton Krebs live up to the hype in his rookie season? The Ice should have a lot more options when it comes to filling the back of the net this season. Emerging youngsters, new veterans and European talent should help even out the team’s top-heavy offensive production from 2016-17. While the ‘big three’ of Vince Loschiavo, Brett Davis and Colton Kroeker will still lead the way, Kootenay should no longer be a one-line show. After scoring a league-low 177 goals last year, the Ice will be blessed with a veritable point-producer in Peyton Krebs, who is finally eligible to join the team on a full-time basis. Krebs, the team’s first overall pick at the 2016 WHL Bantam Draft, has been an exceptional talent at every level he’s played at so far, including the WHL. In five preseason games in 2017, the Okotoks-native had three points and in six call-up regular season games last year, he maintained a point-per-game pace. 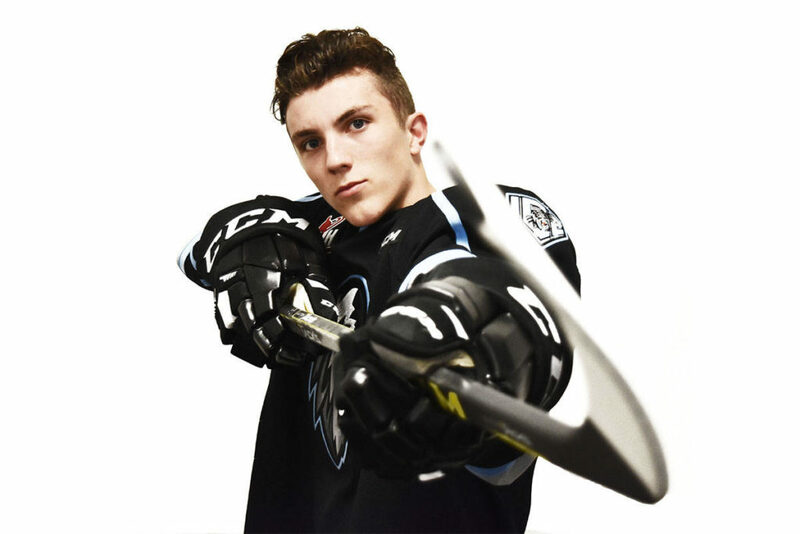 Playing for the CFR Foothills Chemical Bisons of the Alberta Midget AAA Hockey League in 2016-17, Krebs was a star and had 40 points in 29 regular season games and 12 more in 12 playoff appearances. To add to his big year, he was also the captain of Team Alberta at the 2016 Western Canada U16 Challenge Cup and played for Team Red at Hockey Canada’s U-17 development camp. In his brief cameo as a member of the Ice last season, Krebs proved he could compete at the WHL level despite being a little undersized at 15 years old. Now, after a summer of diligent training and natural growth, he’s added size to his total-skill package and was one of the fittest Ice players at training camp. Although Krebs has so far proved his worth as a playmaker, he seems comfortable taking on any role the team wants him to fill. He’s fast, creative and likes to have the puck on his stick. While head coach James Patrick is certain he will be an impact player, he’s said that he doesn’t want to burden the young talent with too much responsibility, too early. Nevertheless, one can still expect him to get plenty of minutes and play with top-end talent in his rookie year. After a massive disappointment at the 2016 CHL Import Draft, when top overall pick Klim Kostin failed to report to the team, fans should be excited to see a European talent at Western Financial Place this fall. Gilian Kohler, a Switzerland-product who the Ice took with the third overall pick at the 2017 import draft, had a tough end of summer with a minor concussion injury, but should possess the necessary talent to make an impact with the Ice. Although he was used sparingly in training camp and only made appearances in the team’s last two preseason games, Kohler has been electric in the short period that he’s suited up for Kootenay so far. Already developing chemistry with Peyton Krebs, the dynamic Swiss forward scored two goals in the Ice’s final exhibition game against the Calgary Hitmen in Crowsnest Pass, Alberta, including the game-winner. While the smaller ice surface and the increase in physical play that comes with playing in North America will no doubt be an adjustment for Kohler, Patrick does not believe it will be an issue. According to the coach, Kohler has enough strength and thickness to handle anything that comes his way and won’t be looked at to be a big hitter himself. Last season, while playing for EHC Biel-Bienne U20, he had 8 goals and 42 assists for 50 points in 43 games. He also made nine international U-17 appearances for Switzerland and had five points. While the success of European imports is always hard to predict, the Ice could very well have a gem on their hands with Gilian Kohler. There are some notable returning blueliners, but the injection of youth into the team’s defence for this upcoming season is significant. The team brought in 20-year-old Jordan Henderson over the summer to add maturity to the backend, but he was released after younger players outperformed him. Although Cale Fleury is the team’s clear leader and should have more support this season, as a unit there are a lot of question marks on defence. With Fleury away at the start of the Ice’s preseason at an NHL prospects tournament, Slovak-import Martin Bodak comfortably stepped up as the team’s top defenceman. A big, strong player with excellent vision and puck handling skills, Bodak impressed the coaching staff and fan-base alike throughout training camp and preseason. A 1998-born player, he played last season in Finland with the Tappara U20 team where he was an alternate captain and put up 22 points in 38 games. Despite being ranked 71st by NHL Central Scouting’s ranking of European skaters last year, Bodak was not drafted and made the decision to come to the CHL after being unable to find a pro job in Finland. Patrick showed great confidence in Bodak in preseason and the blueliner rewarded the coach by putting up two points in five games while logging big minutes against other teams’ top lines. With several young defencemen set to crack the team’s roster, Bodak brings a stability outside of the Fleury-Dallas Hines pairing that should keep Kootenay’s goals against down. The Ice gave up a league-high 335 goals last season, an average of over 4.6 per game. This number should decrease significantly, and if it does, Bodak will be a large part of the reason why. Although it remains to be seen whether Patrick will stick in the WHL past the first few weeks, the 16-year-old has so far defied expectations at every turn. An undrafted player, Patrick was listed by the Ice last year and had to prove himself at camp against several older and more physically mature players. He was even rewarded by recently officially signing with the team. Throughout the preseason, the young defenceman was a frequent source of praise from head coach James Patrick who pointed to his compete-level and engaged play as being among the best on the team. Although his stats in preseason weren’t the best, with zero points in four games and a -7 rating, Patrick looked comfortable playing alongside quality players like Martin Bodak. According to his coach, he did not look out of place at all in any of the exhibition games and has managed to handle any situation — including power plays and penalty kills — with a composure beyond his years. Although fellow 16-year-old Nolan Orzeck, who played three preseason games, was reassigned to Midget hockey to help his development, both players look likely to be a big part of the Ice’s future. James Patrick said that Orzeck will get some WHL games this season and has the best on-ice vision in the organization for defencemen next to Bodak and Fleury. 17-year-olds Bobby Russell and Loeden Schaufler also made the team’s opening night roster and will be looking to make an impact as rookies. Fleury, Hines, Bodak, Sam Huston and Ryan Pouliot should all be the go-to guys to start the year, but with any luck, the team’s younger defencemen will step up throughout the season. The Ice’s goaltenders to start the season are brand new — and that is no exaggeration. Both were acquired during preseason and are unknown commodities when it comes to playing in the WHL. After two seasons of being led by 20-year-old goalies with significant experience — Wyatt Hoflin in 2015-16 and hometown hero Payton Lee in 2016-17 — the new Ice management has shaken up the situation in the crease. Last year’s backup goalie Jakob Walter did not make it past the start of training camp and veteran Mario Petit, who the team acquired over the summer from Everett, was released after preseason. Although 16-year-old Jesse Makaj also looked primed to push for a spot thisseason, he was reassigned after preseason as well. The duo that the team has chosen, have a total of four WHL regular season games between them and the numbers aren’t stunning. In three games with the Regina Pats between 2015 and 2017, Chapman put up an 8.40 goals against average and a 0.781 save percentage. In one outing with the Swift Current Broncos, Bailey Brkin had a 10.00 goals against average and a 0.811 save percentage. Both, however, have had success at other levels of the game. Chapman led the Portage Terriers of the Manitoba Junior Hockey League to a league title in 2016-17 and posted a 2.94 goals against average and a 0.905 save percentage in 16 regular season games. In the playoffs, the 1998-born goaltender was also rock-solid and posted a 2.07 goals against average and 0.931 save percentage in 12 games. 1999-born Brkin, on the other hand, had significant playing time last season with a struggling Calgary Mustangs team in the Alberta Junior Hockey league. Although his stats were nothing to boast about, 42 games in net certainly have him prepared to be a workhorse in the WHL. Having come to the Ice late, Brkin and Chapman did not play a lot for Kootenay in preseason but both were impressive in their brief moments. They both earned wins in the team’s last two games in Crowsnest Pass with Brkin making 45 saves on 49 shots against the Lethbridge Hurricanes and Chapman stopping 25 of 27 Calgary Hitmen shots. Although management clearly has faith in the two goalies selected to lead the team this year, the netminders are perhaps the team’s biggest mystery heading into the season. If the Kootenay Ice don’t make the playoffs this season, it certainly won’t be due to lack of effort on the part of the team’s management and coaching staff. Cockell is incredibly active in his first year as a WHL general manager and Patrick takes his role, as an active teacher for this young group, very seriously. The roster already looks very different from the last two difficult Ice campaigns and if the team manages to regress from their worst seasons in franchise history, it will be a definite shock. The Taphorn twins are a year older and stronger and should evolve from their impressive rookie season. Loschiavo, Davis and Fleury spent time at NHL development camps with the Dallas Stars and Montreal Canadiens, and should be more confident and prepared in their return to the WHL. Kroeker was a point-per-game player for the first time in his career with Kootenay after coming over at the trade deadline from Lethbridge and should be eager to continue his upward trajectory. Veloso and Baer were both fan favourites in their previous cities and should quickly have the same effect as 20-year-olds in Cranbrook. Barrett Sheen was a revelation in preseason, leading the team in points while playing with Krebs and Kohler on a modern day Gretzky-Kurri-Semenko style line. Tanner Sidaway and Cameron Hausinger were both spark plugs who proved they can also create offence. Sebastian Streu appeared out of nowhere, as a European-trained player with Canadian roots, and wants to prove himself on a bigger stage and Eli Lieffers is a 6’4, 17-year-old who can play centre. Becoming an elite franchise will take time, however, and the jump may not be immediate. While there are plenty of exciting newcomers, this season will be a big learning curve for a lot of them. Three proven overage forwards and returning veterans should smooth the transition, but unknown goaltenders and defencemen provide no guarantees for this to be the Ice’s breakout season. It is a ‘new Ice age’ for sure, but fans should be cautiously optimistic. The players will need to buy into the new systems and mantras of the organization and supporters will also be an asset if they do the same and pack the building with enthusiasm. There are a million reasons for Cranbrook and the East Kootenay region to be excited by their hockey team’s future. While a championship or even a long playoff run are still unlikely at this time, an entertaining product at Western Financial Place should be expected every night.